The Plansee is situated in the Reutte municipality in Tyrol, in the middle of the Ammergau Alps, near the two municipalities Breitenwang and Heiterwang. The Plansee has an area of 2.87 square kilometres and is 5.7 km long and 1.3 km wide. It is connected to the Heiterwang Lake through a canal that is about 300 m long. The water of the Plansee is almost as clear as glass due to the lack of algae and you can take a very deep peek into the waters, which have a maximum depth of 78 m.
During a loop hike you can wander around the lake or discover the nearby Stuiben Falls. Or you can start a cycling tour to the Linderhof Castle. In hot temperatures, you can of course also just have a swim in the lake. Diving is also possible and there's even a diving camp at the lake. You can also sail or fish, which are quite popular activities at the Plansee. 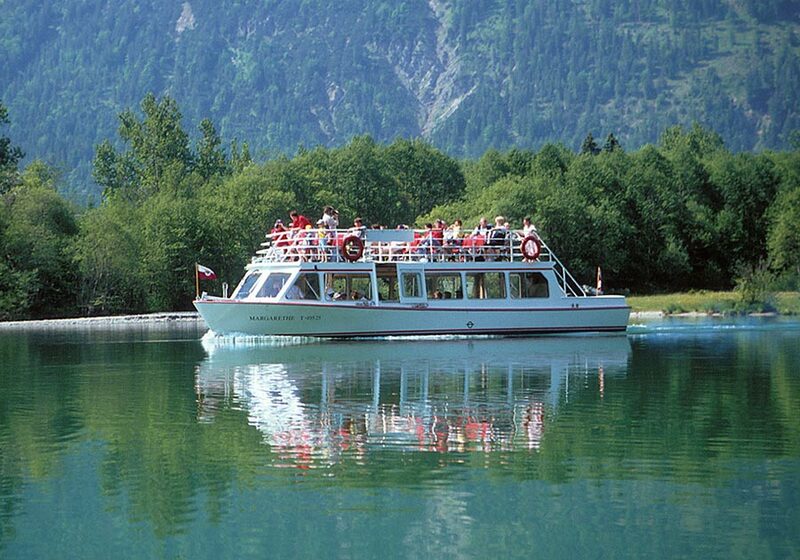 From the end of May until autumn, there are offers for boat tours on the lake. This is a great opportunity to just kick-back and relax and soak in the fantastic landscape. The Plansee is always worth a visit, and its fantastic location between the mountains, as well as the crystal clear waters, always mesmerise the visitors.